Khrystyna Maksymova - Edmonton's Burial & Cremation Professionals | Trinity Funeral Home Ltd. It is with great sadness that the family of Khrystyna Maxymova announces her passing early morning on Sunday, July 23, 2017 at the age of 14. Khrystyna will be forever remembered by her loving parents Svitlana and Volodymyr, her younger sister Anastasiia, her grandparents and family members in Ukraine. She will also be dearly missed by her friends from school and gymnastics clubs she has attended, by her neighbours and teachers. 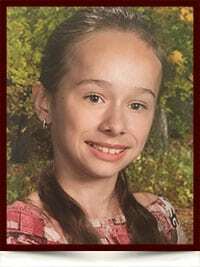 Khrystyna was born on September 21, 2002 in Chernivtsi, Ukraine. A bright, determined, brave girl that loved to put puzzles together, adored all the animals and always did her best to achieve her goals. Khrystyna considered to be a veterinarian or a gymnastics coach when she grows up. She was number one helper for her mother, sister and her neighbours. Khrystyna graduated from St. Brendan Catholic School and was supposed to start high school program at the Archbishop O’Leary Catholic High School in September 2017. She was actively involved in the rhythmic gymnastics. Khrystyna was a competitive athlete at the Elena’s Rhythmic Gymnastics Club in Edmonton. A funeral service was held at the St. John’s Ukrainian Orthodox Cathedral on Wednesday, July 26, at 10 am. A burial followed the service at St. Michael’s Cemetery in Edmonton. Please accept our very sincere condolences on this very very sad occasion, the loss of your oldest daughter. Our oldest dances at Elena’s gymnastics club and we have marvelled at your daughters’ talents at the shows in past years. It breaks our hearts to learn of this news and as a mother, my heart goes out to you heartbroken and wishing somehow one could help. I especially feel very sad for your 10 year old daughter as well to have witnessed and suffered the loss of her sister. Wishing you all much love and praying that time will help heal your pain. God bless your family and keep Kryshtyna by his side in heaven.